Today the National Health Service turns 70. On 5 July 1948, the NHS was established by the Labour Party against all the odds to deliver healthcare for all – based on need, not ability to pay. The National Health Service is one of Labour’s greatest achievements and over the years it has deservedly become a national treasure. This historic birthday is the perfect opportunity to celebrate the achievements of one of the nation’s most loved institutions, to appreciate the vital role the service plays in our lives, and to thank the hardworking staff who make up the NHS. The pride and commitment we feel towards the NHS is stronger than ever. But the challenges facing our health service are some of the greatest it’s faced in its history. Every year around 10,000 parents have to face the unimaginable grief of losing a child. Nobody expects to bury their own child and when struggling to cope with the worst possible experience they will ever have to face, bereaved parents have the added worry of finding funds for a funeral they never expected to be planning. No parent who has gone through the heartbreaking experience of losing a child should be left struggling to cover the cost of a funeral. 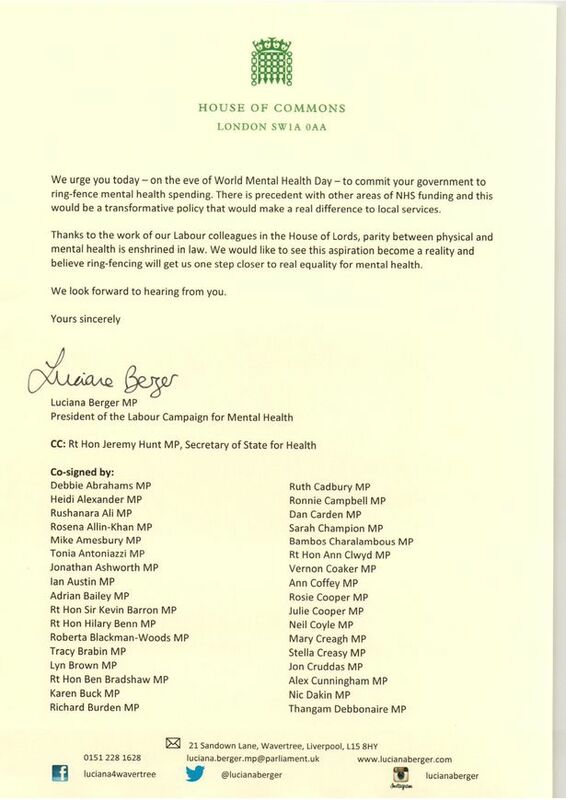 To mark World Mental Health Day, I joined with 160 Labour MPs to ask the Prime Minister that she ring-fences mental health funding. 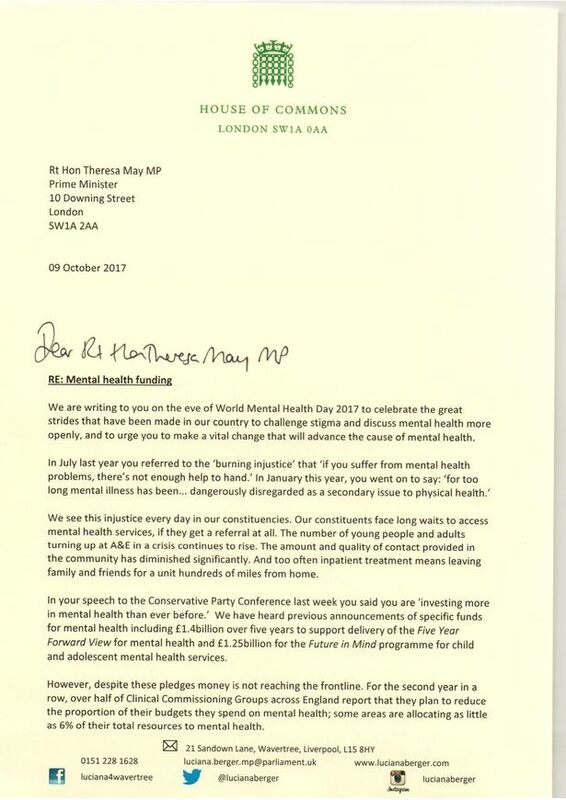 It’s time the Prime Minister’s words on mental health were translated into action. Ring-fencing mental health funding will get us one step closer to real equality for those with mental health conditions. Government cuts to public services are bad enough but it is even worse when investment is approved for projects, only to then be delayed and threatened through unnecessary bureaucratic wrangles. That, however, is what is happening on the Bournville Village Trust College Green development on the site of the former Bournville College on Bristol Road South. A new Health and Wellbeing centre is planned for the site and investment to construct the centre has been approved in principle by NHS England. Now, though, delays by NHS England in revising some if its own rules and procedures are delaying the investment needed for the new centre. The danger is that if those delays go on much longer they could even prevent the centre being built at all. It is a crazy situation. Nobody seems to be questioning the need for the new centre or that it aligns with the strategic priorities of NHS England. It seems to be an entirely procedural wrangle that is holding things up. Today I urged Ministers to step in to clear whatever procedural blockages are holding things up and make sure Bournville Gardens Health and Wellbeing Centre is built as planned. In recent weeks, I have received petitions, postcards and hundreds of other correspondence relating to funding, services and reorganisational threats facing our National Health Service. This is the response I have written to constituents.